INDIANAPOLIS, Ind. 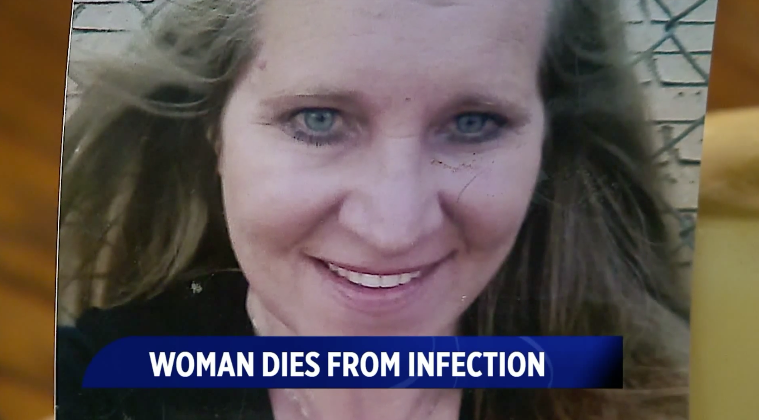 -- An Indianapolis woman died after her family says she was infected by flesh-eating bacteria while on vacation. She did not get the right treatment from a local hospital, according to the family. "They said that they thought it was an abscess or something under the skin," Carol Martin's husband, Richard Martin, told CBS affiliate WTTV. What started as a small bump grew into a large, painful and ultimately deadly infection. "Like a penny or a dime. It was small. She thought it was a pimple. Then the next time it was like this big," said Martin, spreading his hands wide. Carol Martin, a 50-year-old wife, mother and grandmother, died last week. The infection first appeared in February during a vacation in Florida. "The only thing different that happened was that Carol got into the hot tub. That is where I think that it stems from," said Martin. He believes his wife did not receive the proper medical treatment because she didn't have insurance. He says they went to the doctor three times. First, they went to Franciscan Health immediate care and then went to the Franciscan Health ER. The family says they were sent home twice with antibiotics and a heating pad, which they believe just made the infection worse. "At least by the second time they should have decided this is growing and maybe we should take a culture of it and see what it is," said Martin. The family says the next trip to the ER ended in emergency surgery when medical professionals at Franciscan Health diagnosed Carol with necrotizing fasciitis. "The doctor comes rushing in the room and says, 'Listen, we have got to take her to surgery now. She has flesh-eating bacteria.' My jaw hit the ground," said Martin. "We are sorry to learn of the passing of their family member and our deepest heartfelt prayers and thoughts are with her loved ones. Because of federal privacy guidelines, Franciscan Health cannot provide any details about the patients care as were committed to protecting personal health information." Necrotizing fasciitis is a serious bacterial skin infection that spreads quickly and kills the body's soft tissue. The CDC says an accurate diagnosis, strong antibiotics, and surgery are important to stop this infection. Dr. Joette Giovinco says treating flesh-eating bacteria can be challenging. "It's really difficult when you have to treat a patient like this because things can go badly very quickly," she said. Martin says he is now paying out of pocket for an autopsy to find out exact details about his wife's cause of death. He is waiting to hear back on the results. The family says they are seeking legal help to get answers to questions they say they have been asking the hospital for months.